he was the eddying thread of needle-shapes in the shapeless mass of the waterfall. He was the invisible wind that hurried the clouds in billows and ribbons. This book is part of the Canongate Myth Series. If you are looking for a book about WWII in Britain, this is not the book for you. If you are looking for a book that delves deep into Norse Mythology, then pick it up! I started reading this, thinking it was going to be the story of a girl in wartime and was a bit disappointed to find that this book had almost nothing to do with the war. I want to make it very clear so that you don’t go in with the same expectations as me. This is a beautifully written book with so many details but it was not the book I was looking for. I thought the two stories would somehow meet in the middle but this is not the story about a girl reading a book and losing herself in it. You have the girl but most of the time, you have the book. This is pretty much only Norse Mythology. How the universe was created, how they try to restrain Fenrir the wolf and how Loki does his thing. I’m finding it very hard to explain how I feel about this book. The language is beautiful but the pacing is a bit weird. You’d think that this book tells the story of the Ragnarök but nope, the end of the gods happens very quickly. The book wants to tell you EVERYTHING in 180 pages. There was so much information, so many names to remember and I found myself a bit overwhelmed. I wanted to enjoy it and at times I really did but overall it left me a bit lost. I wanted a story but it almost felt like a nonfiction. 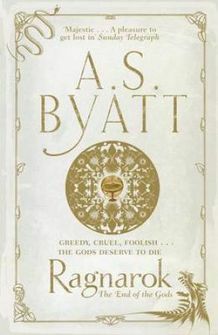 If you’re fan of Norse Mythology and you like elaborate and detailed books, then you’ll like this. Unfortunately, it wasn’t for me.